It's the simple things that can make you happy. For me, one of those is when you call to book an ethnic restaurant, and your booking is taken by someone who is clearly from that region. Such was the case when we arranged to go to Koliba one chilly Friday evening. I'd been waiting for the weather to cool sufficiently so that I could make good on Sarah's enthusiastic recommendation. All that talk of goulash and dumplings and the promise of Krusovice on tap had me very enthused. Situated just down from Smith St, the restaurant is warm and welcoming. Tables and chairs are all dark, solid wood, but plenty of lighting keeps the restaurant from feeling gloomy. High ceilings further ensure that the light offsetting the richly coloured walls and furnishings doesn't cause too much glare. When it comes to main course, the options equate to choosing which carb you'd like with your meat. This is not, unfortunately, a restaurant to take a vegetarian to. They'd be very restricted in what they could order, and would want to be a cheese fan, as crumbed Edam with tartare sauce, potatoes and salad is the only vego option on the list of mains. I did toy with ordering the roast pork with braised cabbage and dumplings - the Czech national dish - but we'd had a quite extraordinary homemade roast pork dinner the night before. I was keen for something saucy too, in which respect I would have been fine with the roast pork as the cabbage is appropriately smothering. 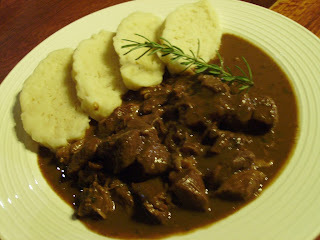 It was a fait accompli though, really: it had to be traditional beef goulash with bread dumplings. The goulash glowed with paprika and was packed with chunked meat. The odd piece was a bit sinewy, but that's OK. It's not a premium cut dish - it's meant to be made with the lesser cuts, made wonderfully rich and gelatinous by slow cooking. The potato dumplings were reminiscent of Ethiopian injera, though without the sourness. They were marvellous for soaking up the sauce, and so pliant you could lay them on your pillow. It would have been drastically improved by even a garnish's worth of vegetable. 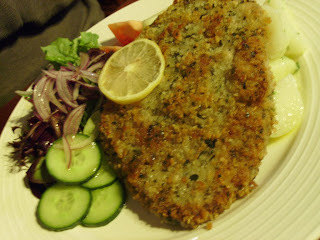 SG didn't have any pork overload problems, and went the crumbed pork schnitzel, with boiled spuds. Again, the portion size rewarded our entree ban, and the meat cut was suitable to the dish. While patchy meat was understandable, some of the potatoes were also a little underdone. Thank god, however, that there were some vegetables to nibble on. There's something about strudel that makes it hard to knock back, particularly when you're in a Czech restaurant with a group nearby ordering in the language of the cuisine. 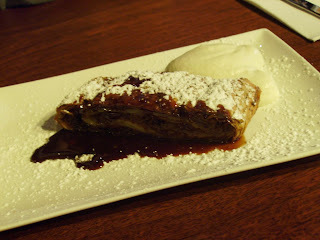 Koliba's apple strudel with walnuts and cream was wonderful: moist, cinnamony and light enough for us to finish the lot. It would be improved by some ice cream melting against the warm pastry, rather than plain old whipped cream. Koliba offers four fruit brandies as well - plum, apricot, juniper or cherry - perfect for that final warming hit before the ride home. I know this is an old post, but I was just thinking about Koliba and how I should go back! I just had a look online; I think they've changed the menu since the last time I've been.